The English Room is home to a collection of rare and important editions of noted 18th- and 19th-century British authors, particularly Sir Walter Scott, Lord Byron, Laurence Sterne, Oliver Goldsmith, James Boswell, Samuel Johnson, TF Dibdin, Robert Burns and Hugh Walpole. Numbering some 5,500 volumes, the majority of the collection was donated to the university by Dr Orde Poynton. 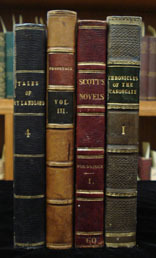 This collection of about 2,500 volumes aims to contain anything published by Sir Walter Scott or about Scott or anything with a Scott association up to his death in 1832. The collection also contains significant later editions and works. This collection is of international significance. A list is currently in preparation. The collection consists of about 800 volumes. It contains editions of works published before Byron's death in 1824 including imitations and piracies. It also includes significant later editions and works. The collection consists of about 550 volumes. It includes editions of works published before Sterne's death in 1768 including imitations and piracies. Significant later editions and works are also included. The collection consists of about 250 volumes. It aims to include all editions of Goldsmith's Vicar of Wakefield up to the death of Goldsmith in 1774, as well as a selected later editions and a few significant editions of his more substantial other works. Only editions of The Vicar of Wakefield are collected actively. The collection consists of about 550 volumes. It aims to include all editions of Boswell's Life of Johnson published during the lifetime of James Boswell (died 1795). Selected later editions are also included as are some editions of other works by Johnson. This is a tiny collection of only about 35 volumes, but it is central to much of the Rare Book collection (the part formed by Dr Orde Poynton). This collection is scattered between the English Room and the Rare Book Room with the more significant editions in the Rare Book Room. Thomas Frognall Dibdin (1776-1847) was in many ways a 'model collector'. His work on the Classics (housed in the Rare Book Room and annotated by Dr Poynton) forms a framework for the Poynton Classics collection. This is a significant collection (about 700 volumes) of contemporary editions of Robert Burns (1759-96) and selected later editions. It is the only substantial collection in the English Room not part of the Poynton Collection. Much of the material in the Burns Collection was transferred from the general stacks in the 1970s after heavy general undergraduate use, which accounts for the mixed condition of the material. Also available is the online resource Eighteenth Century Collections Online (University email login required). Collections held in the English Room are fully catalogued online. Material from this collection can be accessed through the Cultural Collections Reading Room in the Baillieu Library. Requests for material can be made online prior to visiting the reading room. To request material, please register and order here.